The following is a special in-depth report on Venezuela and the state of its food and agricultural system. You may have seen the headlines about Venezuela – headlines that allude to food scarcity, rioting, people eating stray animals to survive, and a country on the brink of starvation. These stories are not only alarming, but perplexing, too. Is this the same country that was recognized by the UN Food and Agriculture Organization (FAO) as recently as 2015 for having nearly eradicated hunger? [i] Is this the same country that has been the focus of international delegations and extensive alternative media coverage for its ‘food sovereignty experiment’ involving agrarian reform, food distributions programs, and direct citizen participation in the food system? [ii] What’s going on? There is a nuanced story behind the current headlines on Venezuela. It’s a challenging moment for average working class Venezuelans as they navigate long lines at the grocery store, a lack of key food staples, and inflated prices in order to feed their families. But there’s not an overall food shortage — food is in abundance, with distribution serving a bottleneck. There are numerous explanations coming from both government and citizens. What is driving the current ‘scarcity amidst abundance’ in Venezuela? How did the present situation come to be? How dire is it, and what are the responses coming from communities, social movements, and the government? To what extent is the present situation being distorted in the media, and why? This article attempts to delve behind the headlines to address these questions. As a producer of a high demand commodity and a voracious consumer of food imports, Venezuela became firmly inserted into the global economy in ways that have rendered it particularly vulnerable to fluctuations in global oil and food prices and to domestic inflation. For nearly a century, Venezuela’s economy has centered around oil, which accounts for the vast majority of its foreign earnings—over 95% at present—and national budget. [iii] Since the 1930s, the orientation towards petroleum also meant a shift away from agriculture, which came with a massive price tag. As both the state and private capital withdrew from the countryside, Venezuela’s peasant farmers and rural workers could no longer earn a living. Many flocked to Caracas and other urban hubs in search of work, making Venezuela one of the most urbanized countries in Latin America, with upwards of 90% of its population living in cities today. [iv] It also became the first country in the region to be a net importer of food, as it was cheaper to import food with petroleum dollars than to produce it. [v] Such conditions facilitated development of a powerful food import and distribution complex, controlled by national and international corporate conglomerates. Venezuela’s ability to import food through oil earnings in the past did not mean that its population was well fed. Indeed, the imports tended to be at prices well out of reach of the country’s poor majority. In 1989, then-President Andrés Pérez signed a structural adjustment deal with the International Monetary Fund, causing abrupt surges in food and fuel prices; the price of bread rose by over 600%. [vii] For the over 60% of the population already living in poverty, enough was enough. Hundreds of thousands of people poured into Caracas from surrounding impoverished hillside communities, protesting in the streets and looting shops. The government responded to this massive mobilization by ordering the military to open fire on the protesters. The official death toll was 276 civilians, with actual deaths estimated to be much higher. At the beginning of Venezuela’s Bolivarian Revolution in 1999, with still over half of the population facing hunger and poverty, both the government and citizens identified food production and provisioning as strategic priorities—and significant strides have been made in the years since. On the production end, the state has made substantial reinvestments in agriculture, including an agrarian reform process to redistribute large landholdings and support small- and mid-scale farmers and fishers. On the distribution end, strategies have included increased availability of basic food items at subsidized and regulated prices and provision of free meals via school and workplace programs as well as community-based feeding sites. What is going on in Venezuela today? While periodic food shortages are nothing new, particularly at politically heightened moments, for more than three years the country has experienced ongoing shortages of particular basic food products in addition to shortages of medicines and personal hygiene items such as soap, toilet paper, menstrual supplies, and diapers. It is the particularity of the missing items that is essential – and often overlooked or distorted in media reports. There is no overall shortage of food and other basic goods in Venezuela. What is missing from supermarket shelves are particular essential items, while others are in abundance. There is a lack of milk, while dairy products such as yogurt and cheese are available. 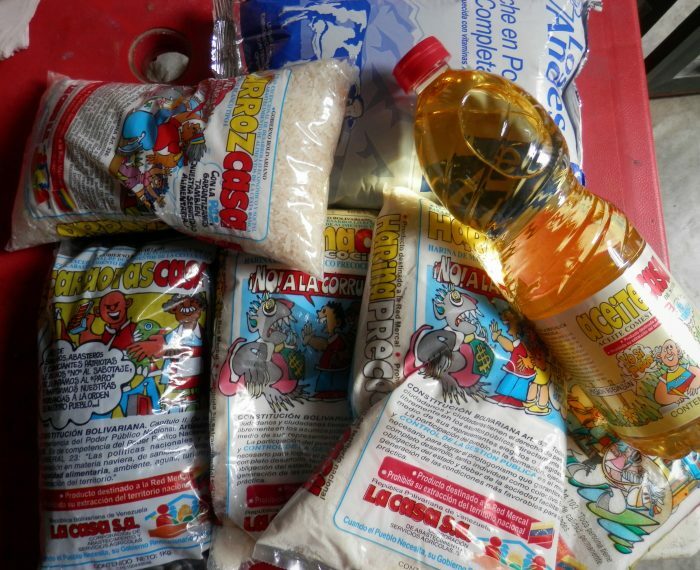 There is a lack of pre-cooked corn flour, while other corn-based products such as porridge are available. There is a lack of coffee, another Venezuelan essential, while teas, hot chocolate, and other hot beverage mixes abound. The plot thickens when one leaves the supermarket and goes out into the streets. Prepared coffee is available on every street corner, and in every cafe. Areperas selling arepas with all sort of fillings are ubiquitous. Why, then, are essential items missing from supermarket shelves? The two most common arguments of the distribution companies are that a) the regulated prices set by the government to ensure accessibility are too low, providing a disincentive to distributors and b) with the plummeting of oil prices, insufficient dollars are available for import of necessary primary materials. When Venezuelan economist and Universidad Simón Bolívar professor Pasqualina Curcio put these claims to the test in her extensive investigation of the country’s current economic situation, she had some interesting findings. [xi] First, several of the missing products have not been regulated since 2010, and among those that are regulated, the government has raised prices in an effort to incentivize distributors several times recently, but this has not resulted in increased availability. Second, the shortages began to intensify in 2013, before oil prices plummeted and while dollars were still readily available. Even once oil prices dropped and dollars became less available, the government continued to prioritize dollars for food import, and by their own accounting, the production levels of Venezuela’s major food companies have been stable or have even increased in that time. Curcio also found a correlation between intensity of food shortages and politically important moments, such as the lead-up to elections. Could it be that the shortages are manufactured? Many food sovereignty activists see it as no coincidence that Polar, the country’s largest food company, responsible for many of the items missing from shelves, is owned by a well-known member of the political opposition to the government. Regardless of what is driving the shortages, there is no doubt they are taking a toll on the population. For most people, the only ways to access basic products are to wait in extremely long lines when and where they are available—and it is important to note that this task falls disproportionately upon women. Another option is to buy basic products as contraband on the street through the parallel market, where they are sold at exponentially inflated prices. Here it bears emphasis again that the shortages are of specific products, so other food remains available. For instance, Venezuela is largely self-sufficient in fruits, vegetables and root crops, which are mostly produced by small- and mid-scale farmers. As these are distributed through decentralized networks, they have for the most part been unaffected by the shortages and are abundant in street markets around the country. However, as people substitute available products for unavailable ones (e.g., cassava, potatoes, and plantains in place of corn flour, pasta, and other processed carbohydrates), increased demand, together with high inflation and speculation, is driving up food prices overall, both in shops and on the streets. The result is an immensely challenging and stressful situation for most Venezuelans as they strive to feed their families. There are several reflections to be made. First, averages do not tell us about impacts on the most vulnerable populations. The flip side, however, is that Venezuela has a host of social programs specifically targeted at most vulnerable populations, which has likely contributed to keeping the caloric averages high. Second, averages also do not tell us anything about food quality. Some argue current conditions are driving people toward more limited and less healthy dietary options, while others argue just the opposite– that as processed options are less available, people are opting for more nutritious whole foods as replacements. Likely there is some of both happening, and data is not yet available to tell us much more. Finally, in the months since these statistics were released, shortages and price inflation have both intensified. Data is not yet available to tell us if average caloric intake has dropped further, but anecdotal evidence suggests that it likely has. 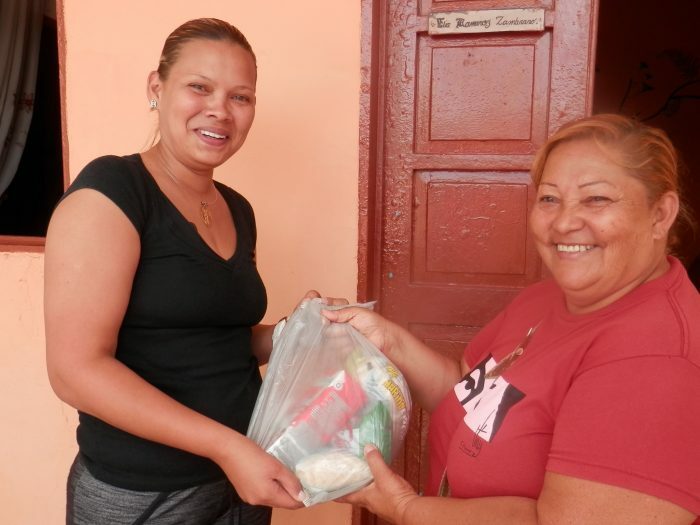 According to the National Institute of Nutrition, however, the situation is being carefully monitored and Venezuelans’ caloric intake as a whole continues to remain well above the recommended minimum. While the government can still do more in its campaign to root out corruption in both the private and public sectors as well as implement further reforms in the currency exchange system, it certainly has not been sitting back in the face of the shortages. On the contrary, both the government and communities are taking the situation seriously, ramping up existing social protections while piloting new approaches. Among the latter are Local Provisioning and Production Committees, known as CLAPs, which have rapidly formed across the country in recent months. CLAPs are partnerships between grassroots organizations and the government to provide an alternative food distribution network in all 24 states. CLAPs have a twofold purpose. In the immediate term, they are working to combat lines, shortages, and speculation by delivering basic food products directly to people. The government purchases goods directly from both private and state enterprises, which the CLAPs distribute house to house based on community censuses. The project is seen as a temporary stop-gap solution to the current shortages, aimed at the most vulnerable fifth of the population. In the longer term, CLAPs are also intended to engage in local food production and processing. In tandem is a major push for urban agriculture, overseen by a newly formed Ministry of Urban Agriculture. A recent hundred-day planting campaign involving 29,000 urban productive spaces throughout the country aims to increase the amount of fresh produce, eggs, fish, and animal protein available locally. 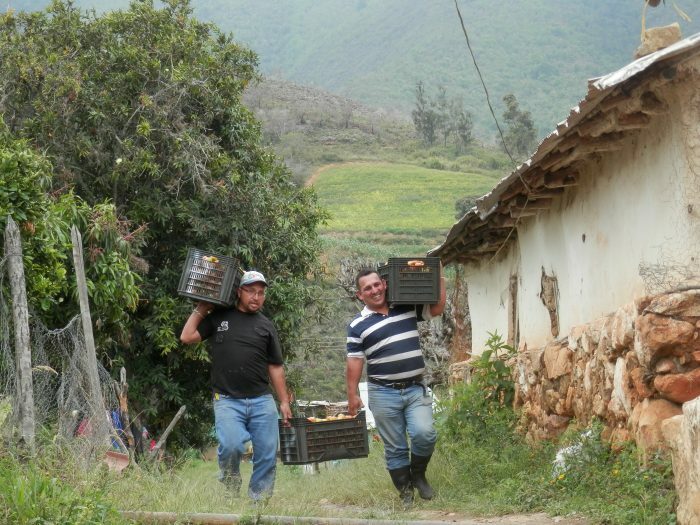 [xv] These efforts are complemented by a renewed push for production in the countryside. Meanwhile, social movements are seizing the moment to forge deeper transformation toward food sovereignty. Driven by necessity, unprecedented numbers of people are engaging and re-engaging in agriculture, from community farms to backyard patios, and in the process, exchanging seeds, bartering goods, and creating new local enterprises. A reduced supply of industrial agriculture inputs is also driving a transition toward organic practices and agroecology, in what some are likening to Cuba’s special period. The shortages are also causing a shift from processed foods and a renewed appreciation of local foods and traditional foodways. Many activists see these developments as elements of a new food system, a project they have been trying to advance for many years. While hunger anywhere deserves high-level media coverage, it bears asking why Venezuela, a country which, by many indicators, has made important advances against hunger and poverty, is being targeted daily for dire coverage that does not reflect reality on the ground. Furthermore, why are the challenges being covered (albeit in a distorted manner), but not the many innovative and successful responses, from an explosion of urban agriculture, to an agroecological transition, to unprecedented levels of citizen organization around food production and provisioning? The answers to this are multifold, complex, and subject to different perspectives and interpretations, but we hope readers are encouraged to seek out more information before taking current news reports at face value. Christina Schiavoni is a PhD researcher focused on agrarian studies at the International Institute of Social Studies (ISS) in The Hague, Netherlands. She has been following food politics in Venezuela for the past decade and is currently in Venezuela doing research in this area. William Camacaro, MFA, originally from Venezuela, is co-founder of the Alberto Lovera Bolivarian Circle of New York and is an artist, radio host at WBAI, Pacifica Network and activist in New York City. The authors would like to extend a special thanks to Siena Chrisman, Fred Mills, Eric Holt-Giménez and Ahna Kruzic for their input and editing assistance. [i] FAO (2015) ‘Venezuela and FAO create SANA, a new cooperation programme to eliminate hunger.’ <http://www.fao.org/americas/noticias/ver/en/c/283757/>. [ii] Schiavoni, C. (2015) ‘ The Venezuelan Food Sovereignty Experiment’ <http://www.thesolutionsjournal.com/node/237281>. [iii] Lander, E. (2014). ‘Venezuela: Terminal crisis of the rentier petro-state model?’ <https://www.tni.org/files/download/venezuela_terminal_crisis_of_the_rentier_petro-state_model._with_very_minor_chaanges_0.pdf>. [iv] Wilpert, G. (2006) ‘Land for People Not for Profit in Venezuela,’ Rosset, P. Patel, R. and M. Courville, eds., Promised Land, 249-264. Oakland, CA: Food First Books. [vi] Boza, T. (2014) La Guerra contra el Pueblo: Reflexiones para el Contraataque Popular. Maracaibo: Fundación Construyendo Ciudadanía. [vii] Hardy, C. (2007). Cowboy in Caracas: A North American’s Memoir of Venezuela’s Democratic Revolution. Willimantic, CT: Curbstone Books. [viii] Curcio, P. (2016). ‘Apenas 20 empresas controlan la oferta de alimentos y medicinas en el país’ <http://www.correodelorinoco.gob.ve/nacionales/apenas-20-empresas-controlan-oferta-alimentos-y-medicinas-pais/>. [ix] Edgard, R. (2016) ‘Los Clap: El resuelve de los pobres’ <http://www.ultimasnoticias.com.ve/noticias/slider/los-clap-resuelve-los-pobres-2/>. [x] Curcio, P. (2016). ‘Apenas 20 empresas controlan la oferta de alimentos y medicinas en el país’ <http://www.correodelorinoco.gob.ve/nacionales/apenas-20-empresas-controlan-oferta-alimentos-y-medicinas-pais/>. [xi] Personal communication with Pasqualina Curcio on 23 June 2016. Also see: Curcio, P. (2016) ‘Los CLAP´S: ¿camino para la paz económica?’ <http://www.celag.org/wp-content/uploads/2016/06/Seguir-leyendo-3.pdf>. [xii][xii] Personal communication with National Nutrition Institute representatives on 27 June 2015. See also ‘Memoria y Cuenta 2015, Ministerio del Poder Popular para la Alimentación (MINPPAL) – Tomo I’ <http://www.asambleanacional.gob.ve/uploads/documentos/doc_a25f279654e41ef2f24b23c31b992098e117a220.pdf>. [xiii] Misión Verdad (2016) ‘Cartografía de los saqueos: actores, tácticas y métodos’ <http://misionverdad.com/la-guerra-en-venezuela/cartografia-de-los-saqueos-actores-tacticas-y-metodos-para-su-ejecucion>. [xiv] See http://www.nytimes.com/roomfordebate/2016/06/28/how-to-save-venezuela/the-us-bears-blame-for-the-crisis-in-venezuela-and-it-should-stop-intervening-there?emc=eta1. Also, for a news clip (in Spanish) of former commander of US Southern Command John Kelly saying that the US would consider intervening in Venezuela to avert a “humanitarian crisis” involving lack of food and water, see minute 3 this video by CNN: http://edition.cnn.com/videos/spanish/2015/10/22/exp-cnne-general-kelly-part-two.cnn. [xvi] Camacaro, W., Mills, F. and C. Schiavoni (2016) ‘Venezuela Passes Law Banning GMOs, by Popular Demand’ < http://www.theecologist.org/News/news_analysis/2986747/venezuelas_people_as_legislators_ban_gmos_protect_traditional_seeds.html>.